reflections: Jargon. It can make or break a book. I also feel like the White Rabbit hollering "I'm late, I'm LATE." Read on to see why. I'm late to the game. Very late. I started reading Apprentice in Death and was confused by the jargon. Then I discovered the book is set in the year 2061. There have been at least 43 books about the character Eve Dallas, written by J.D. Robb who also writes as Nora Roberts. Well, I'll be! How come I didn't know all this? Why is J.D. Robb so new to me? I'm grateful that NetGalley offered the book to me. 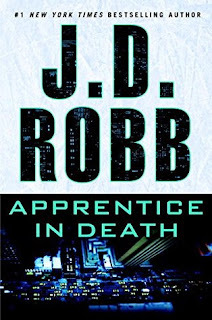 Back to Apprentice in Death, once I got past the jargon, the story grabbed my attention. It is a police procedural. Lieutenant Eve Dallas is hunting a LDSK (long-distance serial killer) who has a young apprentice. Of the dead victims, which one is the one the killer is targeting? Lt. Dallas realizes the LDSK and apprentice aren't finished with their mission. My perspective: I adore police procedural t.v. programs. Law and Order: SVU is a favorite. It's naturally enhances my mood for my soul. Lt. Dallas reminds me of Olivia Benson of that program. Both bark out orders while hunting the perps. Reading Apprentice in Death was a delight. I also enjoyed learning about the new techniques and lifestyles of 2061. I'm adding more J.D. Robb books to my list to read! reflections: I've always been fascinated by the dog's power of scent. My favorite mystery book series 20 years ago was the Bloodhound series by Virginia Lanier. I've enjoyed other books about dog scent ability: What the Dog Knows by Cat Warren and Elle and Coach. Being a Dog: Following the Dog Into a World of Smell is the newest on the list. Have you ever wondered why a dog rolls around in the dirt? Or wondered why sniffing pee is so important to a dog? Alexandra Horowitz, a psychology professor specializing in canine cognition, tells us about her two dogs and experiments. One experiment involved a motion detector camera on a post in the middle of a park to see how often dogs return there to pee and/or sniff. The title Being a Dog also examines how humans (specifically the author) can be more like a dog in smelling and sniffing things. Because Horowitz is a professor, some of her paragraphs are a bit too textbook-like. The topic of scents, however, is still intriguing. Suggestion: read the interview with Alexandra Horowitz as an scentful appetizer, then rush to buy Being a Dog. reflections: Have you ever met someone over and over again throughout your life? Or had many years pass in between meetings? The movies When Harry Met Sally and Two for the Road have this theme. My perspective: A quick read, although I stopped in the middle and left the book alone for many months. It was easy to pick it back up. Jennifer Weiner's books give a relaxing flow through the years. Picture Window template. Template images by carlosalvarez. Powered by Blogger.